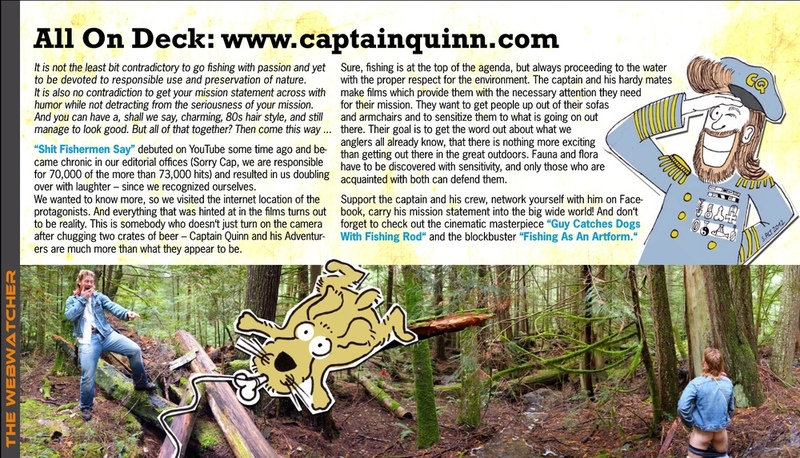 Funny Informative and Intriguing Fishing and Adventure Articles and Stories by Captain Quinn & The Adventurers. Captain Quinn has had articles published in several fishing magazines and has been featured in International Fly Fishing Magazine-SCALE. While producing well researched informative pieces on fishing and outdoor adventure he does so in a light-hearted fashion hoping to not only draw the reader in but also provoke a chuckle with some well placed humor. Captain Quinn is always looking for well researched informative and funny articles to feature from guest writers. If you wish to submit an article for review please EMAIL me here. Funny, exciting and intriguing outdoor adventure articles including tales & folklore, misadventures and wild encounters. Fun Informative pieces on wild edible plants mushrooms and berries.